Unfortunately, ripe produce also invites other guests to the flavor party: fruit flies. These little monsters (drosophilidae), with their big red eyes and kneejerk-wave inspiring flight patterns, aren't terribly harmful (they have a lifecycle of around ten days)...they're just really, really annoying. They tend to dig on ripe (or overripe) fruit, stale water, uncovered trashcans, etc. But, even the cleanest homes can fall victim, especially those who buy organic-method or local farm raised produce, or have their own gardens and fruit trees. But, no worries, you can solve your fruit fly problem overnight, with about a minute of work and this DIY fruit fly trap. Why do you need a fruit fly trap? While fruit flies aren't particularly harmful, they are super annoying. Where do fruit flies come from? If you think they come from inside your fruit, you're mistaken. Fruit flies lay their eggs on moist surfaces, so nearly-ripe fruit is a perfect breeding group for their offspring. A fruit fly trap is the best way to keep these pesky insects from reproducing. Is a fruit fly the same as a gnat? Although both of these insects are in the same family, they're not the same species. Fruit flies are more likely to be found indoors, where they feed on fruits and vegetables. Gnats, on the other hand, are usually found outdoors, where they rotting organic matter and fungal growth. Since we wanted to use and reuse our trap all summer, we opted for a Mason jar. If you don't keep any on hand, any food jar will do, or you can use a drinking glass, and a piece of plastic wrap as the lid. Punch a series of holes in the lid using nail or awl. Make them big enough to allow the fly in, but not so big that it will be easy for them to escape. Fill the container with about a half cup of beer, or to whatever fills the container halfway. If you'd rather not use beer, try using a fruit juice or apple cider vinegar flies love. Screw on the lid, then take to the place where they flies are a-hovering...your fruit bowl, pantry, etc. Move any other sweet smelling things to a different location (like the refrigerator), making sure no fruit flies have hitched a ride. Overnight, the flies will smell the beer (or juice/vinegar), and eventually fly in to the fruit fly trap. They'll hover around above the liquid, eventually falling in and drowning. Every few days, pour out the flies and some of the liquid, and add more to give it a fresh aroma. Repeat as necessary. Update: it turns out that apple cider vinegar is actually a better liquid to use for this type of trap (it smells stronger and lasts longer than the beer ... not to mention you don't have to waster perfectly good beer on fruit flies). Another fruit fly trap design involves using a paper cone to funnel the critters down into the liquid. The picture is fairly self explanatory, you just roll the paper up, tape it and jam it up in top there. (I've taped mine down too). But actually I reckon if you used fruit enough you could probably make the trap non-fatal. I was once in a Buddhist temple in japan, it was late September and the mosquitoes were enough to incite craziness. The monks told us NOT to swat them, we could shoo them if we must, but it would be better to let them have a meal then go on their way. I am not a very good Buddhist. I had those meal moths. I didn't know it because they were in a cabinet I hardly ever went into. They got bad, and then the brown widow spiders set up shop to eat them. It was not fun trying to get rid of those, let me tell you! From now on, all grain stays in the freezer. after doing some resesarch, i decided on filling a mason jar with regular vinegar, a splash of dishwashing soap, and a slice of ripe banana. Before I could even get the cling wrap out of the cupboard, the fruit flies were already swarming! It seems to me that as long as there's only one tempting thing in the room (you've cleared any fruit off the counters, taken out the trash, etc) anything fruity or fermented will attract them....you just need to find a way to make them stuck there! thanks for the tips! I just stopped at the local hardware store for a project, and saw a commercial fruit fly trap under the trademark name "Terro." With a retail price of near $10, I was determined to figure out what the liquid was in the small 1/2 ounce vile that came with the physical plastic trap; looks like a small apple. As soon as I poured the red liquid into the trap, I smelled the liquid. APPLE CIDER VINEGAR! Then I found this site, and it was confirmed. Seems that a commercial manufacturer would use the most effective and safe product, (liability issues, right?). So now, I'll start manufacturing similar traps around our house. Thanks to all the contributors for the additional input. best from Al in SoCal. I found they love used coffee but could not trap them. Added used coffee beer and a drop of dish fluid and works great. They all swarm right in there. Just set up a trap with orange juice in it. C'mon you little monsters, I want my room back. You don't even need a lid. Just pour a little cider vinegar in a small bowl and add a couple of drops of dishwashing liquid. any brand of vinegar and soap works. The fruit flys like the vinegar, go in, and the soap drowns them. It really works. I had the little moth like things in my pantry, and so did my sister. I ended up having to dump anything dry, even if it was packaged, then clean the pantry thoroughly. It's the only thing that works. Apple cider vinegar and a drop of dishwashing liquid works better than ANYTHING! Moths and their larvae can be killed by putting your flour, rice, pasta etc in the freezer for a few weeks. They can't survive the cold temperatures. We had a big problem with the little buggers and freezing works every time! Has anyone tried this for gnats? I have also used a white bowl with water and a drop or two of soap under a night light. I set up two jars, one with beer and one with apple cider vinegar. While many have said here that beer works for them, in my test the vinegar had clearly won out. Who knows maybe its because of location? I don't know. But those fruit flys we definitely diving into this jar and NOT getting out. I also kept moving the jar in different locations to get the stragglers. Thank you so much for this great idea!!! I have these nasty little mothy things in my pantry (maybe from cereal or something). Does anyone know if this will work on them? I think I will try it anyway and comment on whether it does. Or do you have an idea that will get rid of these mothy fly things? Thanks for your help. The juice/vinegar left in the pepperoncini jars makes great bait and kills fruit flies. We learned that quite by accident. I always use cider vinegar (and it definitely matters which brand you use, 'cause the generic store brand has never worked as well as, say, Heinz), dishwashing soap, and a paper cone, which works like a lobster trap--they can get in but they can't get out. 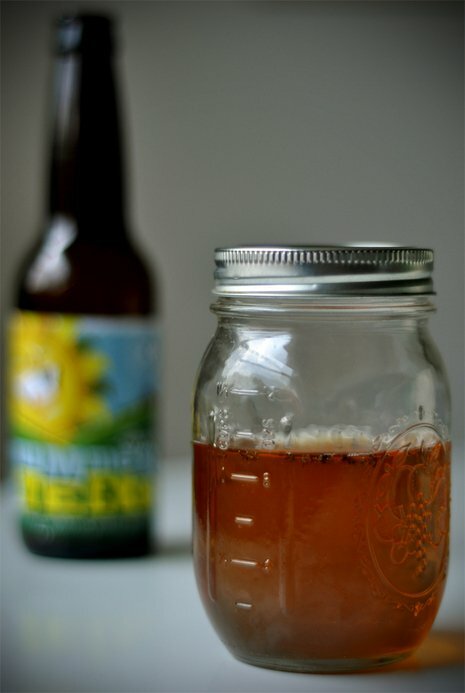 i've done this with apple cider vinegar and it works pretty well, but i like the beer idea! thanks! If you don't want to make holes on a lid for use later, I always use clingfilm and make little holes and wrap it tightly around the top of the jar. Works a charm!